I've gotten lots of questions about whether the children (or husband!) in your household can use your digital kits. I've asked designers about this, and overwhelmingly the answer is yes! Sharing with your friends? Not so much. kits are licensed to one user only: the person who purchsed it. Most designers have agreed in message board discussions on the topic that sharing is fine within a household for members of a household -- i.e. a mother buys a kit, her 12 year old daughter can use it. Having friends over to use the kits you bought is a shady area. My best friend digi-scraps and I don't let her use my kits, nor do I ask if I can use her kits. I personally wouldn't feel ok about it, since I know that it not what the designer intended when they sold us those kits. Kits are not to be shared, except by family members in a household. One designer compared it to a gym membership -- you are the only one who can use your membership. You have to pay extra for a family membership if you want to bring people with you, and if it's a friend who wants one, they have to buy their own. How to protect your artwork . 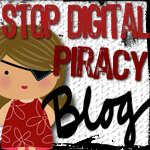 . .
Gina Jane Johnson of daisiecompany.com wrote up a GREAT article for this site, called "About Digital Piracy: Prevent Plundering of Your Portfolio." It is chock full of information, the most important of which is how to deal with the FBI about these problems. Click on the link below to read, or download the entire article. Download the article in Word format here. Just a question - Is it OK to make a card with a kit? I love the computerscrapbook website (with the e-cuts cards) and have wondered about taking that idea and using various kits I like to make cards to send to friends, etc - through the regular USPS. Not for any commercial venture - just to send a much cuter card than I otherwise could come up with. BTW, I so appreciate this blog that answers any questions we might have. Thanks! oh, it's TOTALLY ok to make a card -- great question! interesting that you mentioned commercial/professional use -- if you WERE to do make cards to make money, you would need permission from the designer of the elements you use -- many are perfectly willing to talk about such things. You can find the policies of many designers at the Professional Use policy list, also at jenstrange.com . thanks for the question!!! glad the blog is helpful! You haven't mention the Creative Commons licenses. Don't ignore them, please. Restrictive copyright is not the only way. However, they didn't leave an e-mail addy, so I can't write to ask for clarification. It was on the "Intellectual Property Rights" post. Now most of you know that I am a layperson (read: I don't know a lot about law stuff) . . . I just write about what I have learned thus far, and what people who DO know about stuff have told me. So I would love some clarification as to how Creative Commons licenses applies to digital scrapbooking. Thanks, y'all! As in, "No, no, you've got the wrong idea." DISCLAIMER: Please do not turn me in for sharing a tube of an apple. This apple may look like an apple in your kitchen but I can promise you this that I did not rip off your apple, I did not take a picture of this apple, and if you'd like to turn me in for downloading fruit, you have too much time on your hands. Please be kind, this apple was tubed by an individual on the net, this isn't your apple, I promise, she tubed her very own apple, not yours. No theft, no illegal act has been committed, it's simply a 45 cent apple, one you can find at any store. I admit, I did not create the name "apple" and copywrite it so technically I guess I could be breaking the law and I could be going to hell. If you do not want to go to hell with me, simply do not download this apple and delete this e-mail. Thank you. Bwah ha ha ha ha. Ok, so I think maybe I need to back up and clarify. What I'm trying to do here is to help people understand that the kits, elements, papers, etc., created by digital scrapbook designers -- whether purchased or obtained for free -- are not to be redistributed in any way by anyone who doesn't have permission or a license to do so. So spread your picture of the apple all over the internet. It's all good. And thanks for the laugh. When you write "Random graphics and images and photos, I don't care what you do with." - you are WRONG. This IS the battle you are fighting! Piracy is piracy. If you don't care about any copyrighted graphics except those that belong to scrapbook designers, then you are effectively using exactly the same rationale as the "tubers" do. I hope that you will reread this article and decide to do a little editing, because what you are saying to people is "Copyright violation is OK by me as long as it isn't scrapbook stuff." I did say that "This isn't to say that sometimes the things tubed are from copy-righted graphics or photos." And I'm not giving permission to steal other graphics or photos that are copyrighted. And it's not that I think it's ok to do so. I don't like what I've heard thus far about tubers, but that seems to be a WAY bigger issue than I can take on. It's just that I personally don't have the resources to know where all graphics and photos that are under copyright are originated from. Thus I wouldn't know how to notify the copyright holder of the infringement. These are not the groups we monitor and report. I stand by the statement we often repeat here, that unless you did not personally create an image or have permission from the image copyright holder, you should not be distributing the image in any form. That applies to many things, and as an educational effort, is at least a notice to tubers that they need to stop and think about the images they are working with. The previous blog entry, "More websites about piracy" lists 10 websites of various industries and groups that are specifically about piracy. Piracy of software, music, videos, books . . . I obviously can't fight these battles, either. And while I support their mission, their individual industries have specific organizations to deal with the problem in the respective industry. And that's what we're about here at the Stop Digital Piracy Blog, for the digital scrapbooking industry. Perhaps there are groups like this for photography copyrights and general graphic copyrights. If there are, I would love if someone let me know. Then we could post their information for people to contact when they run across infringements and could help in this respect. I've edited the paragraph in question, edits in italics, to help clarify the point. I hope this clears things up. Let me know. Thanks again for the comment. I moderate comments around here because I've learned that the kind of people who make it necessary to have this blog in the first place -- you know, the people who like to steal things and refuse to accept that it's wrong -- can be pretty nasty. So you will no longer see their nasty comments, although I still get the pleasure of reading them. Anyway, the other day I got one from someone in or around London that said "lol, i just stumbled upon this blog from google. dude, do u really think by doing this, piracy will somehow disappear? havent u got a real job?" Well yes, I do have a real job, and I choose to do this in my free time because it's important to me. And no, I don't think piracy in all its forms will magically disappear. But specific to digital scrapbooking, this site has made a lot of progress already as far as education, awareness, and centralized information for the problem. In accordance with Title 17 U.S.C. Section 107, any copyrighted work in this message is distributed under fair use without profit or payment to those who have expressed a prior interest in receiving the included information for non-profit research and educational or criticism purposes only. A court is the one that is going to decide if any of the list of 6 purposes apply, and then weigh & apply the 4 listed factors as necessary. I think there's probably a good argument for extending the "teaching" and "educational" language of this section to other kinds of training, though I don't think these Yahoo groups would ever fall within anyone's definition of an educational group, no matter how you defined it. I've seen this argument floating around for months about these Yahoo swapping groups, and never thought it was a good one. (i.e., I don't think those terms should apply to these kinds of groups - that's not primarily why they were created, and they're being used as a diversionary tactic). Overall, I just can't see any court condoning as "fair use" what amounts to unauthorized reproduction -- digital theft . Laughing at it, or continuing to do it, after being informed that it is unauthorized reproduction of a copyrighted work only makes their offense more egregious, at least in my opinion. I don't think a judge would even get to weighing the factors in these instances, then. I think those are saved for cases such as newspapers that quote just a bit too much of a copyrighted work, and it is challenged as being more than "fair use", for example, under factor #2. Or a university that distributes copies of a copyrighted material in teaching a course, and perhaps the professor copies an entire book for the class (I've been in one of those), and the author challenges the use under factors #3 and #4 (because the professor has taken away the market value of the book for class members, by copying too much, when maybe just a chapter or two would have sufficed). Those are just examples. I think I also mentioned the other day about running into a university policy online for posting student portfolios and complying with fair use principles, and deleting the material within a fairly short time period. That university seemed to be very conscious of the possibility of copyright infringement from the student portfolios if they remained online too long. I know that when you get called on bad/illegal behavior, your first response is to loudly declare why what you're doing is ok. But the safer, logical thing to do would be to STOP PARTICIPATING IN PIRACY. duh. Some people claim that forwarding e-mails containing links to pirated materials is ok as long as they themselves did not do the uploading. Do you think that the person driving stolen stereos across town wouldn't get arrested when caught if he said "But I didn't STEAL them, I'm just DRIVING them somewhere" ? Why a person is, indeed, responsible for the contents of every e-mail they forward. Thank you to Miki from Microferk Designs for her well-written explanation. DO NOT PASS ON LINKS TO DOWNLOADS AND/OR FILES WHEN YOU HAVE NOT DETERMINED THEM TO BE LEGITIMATE LINKS THROUGH THEIR RESPECTIVE TOUs. 2.) Doing so implicates YOU of piracy, as you are complicit in the delivery of STOLEN (illegally obtained) goods and violating US Copyright Laws. 3.) If you download the above sorts of files, you are guilty of RECEIVING stolen goods and violating US Copyright Laws. 4.) If you did not obtain the product from the venue of the artist's choosing (such as her website, blog, store), you have no right to it and continuing the act of stealing it (by forwarding an e-mail with links) violates US Copyright Laws. DISCLAIMER: We do not claim to have made all of the items that we are sending to this list. They come from a wide variety of web sources & are therefore deemed to be public domain. As far as we are aware they are licensed for personal use only and are copyrighted by their respective owners. Each member is responsible for their own sends and owner of said group will not take responsibility for group members actions, may they be in question. Any infringement of said copyright is non intentional & will be rectified upon notice & proof of ownership. It's a nice try. But here's a clue, people. if it wasn't PERSONALLY created by YOU, or unless you have a license to distribute a designers works, IT IS ILLEGAL TO SHARE. If you download a copyrighted work from anyone other than the creator or a person with a distribution license, you are also guilty of piracy. The whole point of a moderator is to observe and moderate the actions of a group. You see every message that is sent. If you allow a member to share the works of a designer that is clearly not their own work, by not putting an immediate stop to it, you are tolerating and even encouraging the activity. When the zipped shared files have a DESIGNER'S NAME clearly in the file, does that not clue you in that maybe it's a pirated copy? Worse yet, the links that hotlink to the designer's site and steal their bandwidth. You shouldn't wait for a designer to be notified of the infringement and for them to personally contact you to resolve the issue. It should be resolved IMMEDIATELY when a message is sent, and that group member should be given a warning. If you allow pirating in your group you are just as guilty as the ones pirating. "As far as we are aware they are licensed for personal use only and are copyrighted by their respective owners." That's right. You are AWARE that they are copyrighted and licensed for personal use only. Know what these mean? It means NO BODY has the right to re-distribute them in ANY way without expressed permission by the owners! It means sharing it with other people be it by emails or over a group is WRONG and a VIOLATION to the copyrights law! "They come from a wide variety of web sources & are therefore deemed to be public domain." Uploading or downloading works protected by copyright without the authority of the copyright owner is an infringement of the copyright owner's exclusive rights of reproduction and/or distribution. Anyone found to have infringed a copyrighted work may be liable for statutory damages up to $30,000 for each work infringed and, if willful infringement is proven by the copyright owner, that amount may be increased up to $150, 000 for each work infringed. In addition, an infringer of a work may also be liable for the attorney's fees incurred by the copyright owner to enforce his or her rights. Whether or not a particular work is being made available under the authority of the copyright owner is a question of fact. But since any original work of authorship fixed in a tangible medium (including a computer file) is protected by federal copyright law upon creation,in the absence of clear information to the contrary, most works may be assumed to be protected by federal copyright law. Being available from the web doesn't mean they're in public domain - therefore they are not necessarily copyright free. Not everything on a website is free for the taking! Freely obtained does not mean free to or redistribute!